Hailey is an indie-folk singer-songwriter from Williston, Vermont. Her vocals are sweet and sassy, accompanied by her skills on piano, ukulele and guitar. With influences from Sara Bareilles, Ingrid Michaelson, The Head & The Heart, and Coldplay, Hailey’s indie-folk songwriting is easy-listening for all ears. Hailey is graduating from McNally Smith College of Music on May 6th, 2017! To celebrate her completion of her Bachelors degree in Songwriting and Composition, Hailey will have her senior recital in the Soundbite Cafe on Friday May 5th, at 3:30pm. The performance will feature some solo songs and collaboration with Pharaoh, One More Day, and backup vocalists Michaela Arneson and Madie Vanden Heuvel. Check out the Facebook event page! I am so excited to announce that 'Undertow' will be played on The Local Show with Andrea Swensson on Sunday January 8th on 89.3 'The Current'! Join Hailey as she plays The Skinny Pancake in Burlington, VT! Band of The Land will open the night at 7pm, and Hailey will play at 8! Eat some crepes, tip your waiters, and enjoy some awesome live music! Come join Hailey at The Amsterdam Bar and Hall in downtown Saint Paul on December 8th! Doors open at 7pm, and music starts at 8! Charlie Christenson will kick off the night with an intimate acoustic set, Hailey will play at 9, and the lovely Enharmonic will play at 10! Aside from recording her first full-length studio album, Hailey worked hard all summer 2016 as a featured writer and vocalist for "loveofpharaoh"'s new project! Hailey is a writer on "Dark Side", "My God", and "Running Away (Home)". She is also a featured vocalist on "My God", "Moments", and "Running Away (Home)". It was an amazing project to be apart of, and always a pleasure to work with Eric! Hailey has spent the last 10 months recording and writing for her first full-length album! Once again, she has teamed up with Eric "Realistic" Goble of "Realistic Productions", and it looks like the album will be a smashing success! Hailey has hired local McNally band, "One More Day" to play behind her in the studio, and the sessions have been awesome! Stay tuned for the album release (December 9th), and a release party in both Saint Paul (12/8) AND Burlington (1/6)! Hailey has released the official single for her upcoming album, "Not Sorry". The single was released November 18th and is called "Allie Cat". Sassy and sultry, the song has been very popular amongst all audiences! Hi @JeffreeStar I hope you’re having a great day/night I was just wondering what you thought of Jojo Siwa? Hailey's first studio EP. Recorded spring 2015 in the McNally Smith Recording Studio Complex. I did this arrangement for my Arranging 2 final with Adi Yeshaya. I chose the song because I was especially familiar with it after a childhood obsession with Snow White. The track features a midi Steinway piano, drum kit, and upright bass sound from Logic Pro X. I recorded the vocals with my Yeti USB mic. Originally I had done harmonies along the whole melody, and then just cut them down to where I thought was appropriate. I included harmonies over the line, “I love you" to make it sound like two people were saying it, like the singer of the lyrics is hoping for. I did this song for my final in Scoring For Media with Sean McMahon. The song was inspired by a melody I wrote in 2015 that sounded very cinematic. I used it over a scene from the Christmas film, ‘Love Actually’, and it features entirely midi instruments (piano, synths, bells, violins, chimes). This song was on my 2016 album, Not Sorry, and remains one of the catchiest and most popular songs since its release. I played an abridged version of the song on midi violins into Logic Pro X, and cleaned up the scores in Finale. I had the opportunity to record it with a live string quartet in April 2017, and we got about four takes in the 25 minutes we had to record. I wrote this song originally in early 2016, but it didn’t become a pop/hip-hop song until early 2017, when I was collaborating with my producer, Eric Michael. It’s very simple, and includes what I would call “bubblegum pop” lyrics. I wrote the chord progression, but I believe that my voice is the only real instrument on the track. This song started with a chord progression in September 2016, which I recorded for a session mostly because I needed to lock down something for the album. There were about three different topics and melodies I had, but I liked this one most in the end. It’s about a boy who I went on two dates with, and then told me “I think this is going to be a long-term relationship”, which really freaked me out, and so here we have this song. All instruments were recorded live in October of 2016 with members of One More Day on bass, drums, electric guitar, and keys. This song went through a lot of transformation, from the original chord progression and lyrical set in September 2015, to a complete content change with Jeff Harrington in February 2016. The original draft of the song was a little unclear and so Jeff and I re-worked the overall concept and it became a song about Sleeping Beauty. All instruments (voice, piano, bass, drums, guitar, violin, cello, and additional keys) were recorded live at McNally in September. I wrote this song as sort of a hit at myself for not being able to commit to anyone romantically in September 2016, and it has continued to be many people’s favorite. I wanted to keep the arrangement simple, with only voice, piano, bass, and strings (violin and cello). All instruments were recorded live at McNally. I wrote this song in 2015 as my final assignment in Gary Rue’s Songwriting II class. I was inspired to write the song after I learned that my ex boyfriend was dating brown-haired songwriter who also played violin. Perplexed, I wrote this on ukulele, and recorded it in 2016 with One More Day on bass, drums, electric guitar, and keys. My recital took place on May 5th, 2017 at 3:30pm in the McNally Smith Soundbite Cafe. You can listen to each separate song from my recital on my website. I wanted my recital to be a sort of “evolution of Hailey” so I split the order by songs I wrote in each of my three years at McNally. My first year, I was very independent, and I released a six-track EP at the end of my Freshman year called Home. I played three songs off this (You, In The Morning, and Home). My second year I became very involved in writing for hip/hop and pop music with Eric Michael and Josiah “Pharaoh” Kakish, so I did a song off Eric’s upcoming project (Fall 2017) and a medley of two of the songs I had done with Josiah off of his album from August 2016, Jakob. The second-half of my second year at McNally I released an album called Not Sorry, which I released on December 9th, 2017. The next five songs on the program (Polaroid Picture, Undertow, Allie Cat, Sober Night, and Tic Tac Toe) are songs from that project. The four original songs you heard above are also on that project. The final phase of my recital was to showcase a new song that nobody had heard, and that’s where you hear “Tease”. I met with the New Media Strategy class in February of 2017, and it was overall a very helpful meeting. I went to the class with an official website and active social media presence. The main points that the class came up with was that I needed to update my website, because at the time it had no upcoming shows, when in fact I had several. It was also suggested that I come up with a clever and hooky name for my senior recital. In a play off my last name, “A Ward Show” was suggested, and I liked it so much I kept it. I made the Facebook event for my recital about a month before the show itself, and released the poster for it on Instagram two weeks prior to the show. Overall, I would say that my strategy was very successful, as I had almost 50 people of all ages at my recital. People loved the name, and thought it was very funny. I was informed that I needed to do my recital in the spring later than other students, so if I could do anything differently I would have liked to do it in the auditorium. Hailey is a 20-year-old indie-folk singer-songwriter from Williston, Vermont. Her vocals are sweet and sassy, accompanied by her skills on piano, ukulele and guitar. With influences from Sara Bareilles, Ingrid Michaelson, The Head & The Heart, and Coldplay, Hailey’s indie-folk songwriting is easy-listening for all ears. Radio Bean, Halvorson’s, 242 Main, Five Corners Farmer’s Market, Westford Farmer’s Market, and The Skinny Pancake. Interlochen Center for The Arts’ Kresge Amphitheater, Dendrinos Chapel, and Corson Auditorium, The State Theatre in Traverse City, and Horizon Books. The Acadia, Honey, Aster Cafe, 7th Street Entry, Black Dog Coffee, Riverplace Farmer’s Market, Tattersall Distillery, and The Amsterdam Bar and Hall. 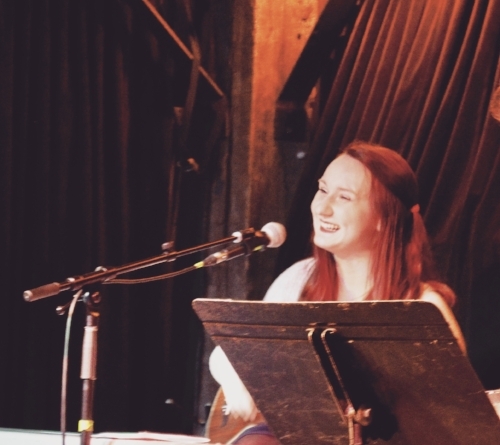 A 2014 alumna from Interlochen Arts Academy in Interlochen, Michigan, Hailey was one of the first graduates of their newly minted singer/songwriter program under the guidance of Courtney Kaiser-Sandler and Kyle Novy . By the end of the two-year program Hailey self-produced her first five-song EP, titled, This Little Light, which is available through iTunes and Bandcamp. In Fall of 2014, a recipient of the McNally Smith Platinum Scholarship (the highest merit scholarship offered by the college), Hailey began her college training in songwriting and composing. Her music captured the interest of Eric Goble of Realistic Productions, a producer and musician who offered to help Hailey produce her next EP. By early spring of 2015 her first studio EP, titled Home, was released. You can find it on iTunes. This production was well received by the Hailey’s local music communities in Minnesota and Vermont. Driven to explore her passion for music and embrace new cultures, Hailey travelled to Enschede, Netherlands in the fall of 2015 to study music at the Institute de ArtEZ as an exchange student. This experience broadened her perspective on the influence of community and the shared language of music which bridges cultural barriers. Upon her return to the States, Hailey began planning for a full-length album with her producer and business partner, Eric M. Goble of Realistic Productions. They laid down the main instrumental tracks for four of the songs in January and February of 2016. In March, Hailey had her tonsils removed, which allowed her voice to sit in a healthier place for the album as a whole. Hailey brought on local twin cities band, One More Day, to be her band for the album, and In October 2016 the album was finally finished being recorded. After months of hard work, Hailey Ward released her first full length studio album, ‘Not Sorry’ on December 9th, 2016. It is available on iTunes now! In June 2017, she had the opportunity to compose, arrange, and sing vocal loops on a loop package by Sound Oracle due August 30th. She can also be heard on Realistic Productions’ first full length album Entourage due out in October as a vocalist and songwriter. She is currently writing music for her next personal release. 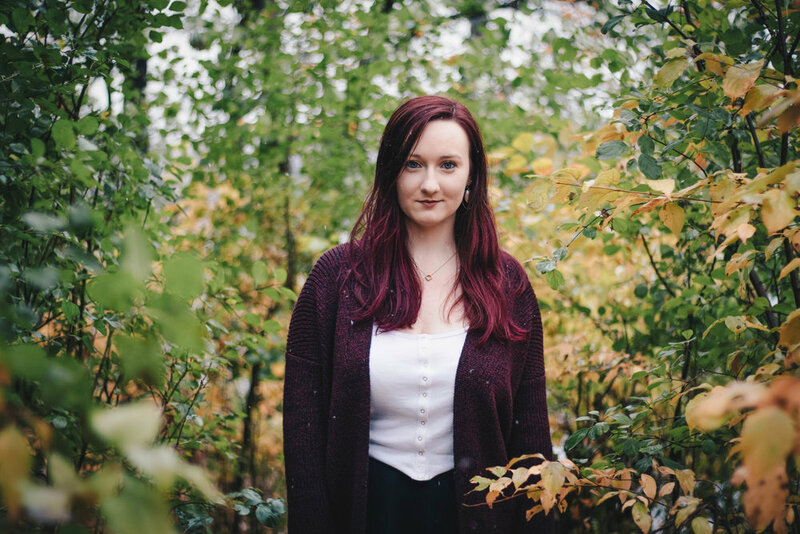 Saint Paul, MN - Local Songwriter and McNally Smith College of Music student Hailey Ward completed her first full-length studio album in Fall of 2016. The album was released to the public on December 9th, 2016, and is currently available on all streaming major platforms. The album is made up of ten completely unapologetic songs surrounding Hailey’s personal relationships and life from 2015 to 2016. She co-produced the album with Hip-Hop producer and business partner Eric M. Goble (“Realistic Productions”) to bring an exciting set of ears on the project. She also invited local band ‘One More Day’ to play behind her on the album. From January thru October 2016, Hailey and Eric were hard at work recording and planning. A show to celebrate the release was held at Amsterdam Bar & Hall in downtown Saint Paul on December 8th, 2016. Doors opened at 7:30, and local musician Charlie Christenson kicked off the show at 8pm, followed by Hailey Ward accompanied by One More Day at 9pm, and Enharmonic at 10pm. Tickets were available online for $10 in advance and at the door, or $5 with a McNally Smith Student ID. Hailey Ward is a 20 year old singer-songwriter from Williston Vermont. Apart from playing shows in the local area, she also has three independently released records where she showcases her songwriting. Her vocals are sweet and sassy, accompanied by her skills on piano, ukulele and guitar. With influences from Sara Bareilles, Ingrid Michaelson, The Head & The Heart, and Coldplay, Hailey’s indie-folk songwriting is easy-listening for all ears. Eric Goble of Realistic Productions is a co-writer, producer and chief engineer of my individual projects. I co-write a lot of pop music (chords and lyrics) for Eric as well as occasional string and vocal arranging. Eric introduced me to the hip/hop scene and is the main reason I work with Josiah Kakish (Pharaoh). Graduated one year early from high school.